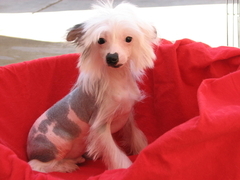 Thank your for your interest in CAMMIE'S CHINESE CRESTED IN SUNNY ARIZONA. Below is some information on the breed. This dog in reality is a medium sized toy dog. 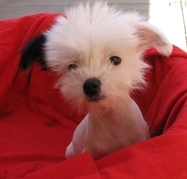 He is not as small as a Chihuahua nor is he like the Peruvian Hairless. He is small and sleek. He is a hunter by nature and is still quite capable of killing birds and mice. The best way to describe this beautiful creatures is to say that he is quick, speedy and precise at almost everything. 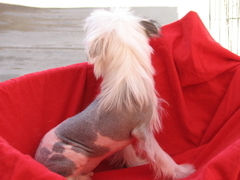 A slow, reluctant Crested is not typical. Usually Crested are shown with the hair clipped off of the face but they can have a full face of hair if left unshaven. The Powderpuffs have a silky veil of hair and can also be left unshaven on the face if desired. 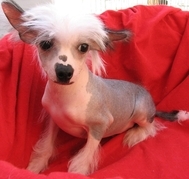 Both varieties can appear in the same litter, the gene that controls the hairlessness is dominant, so from a Hairless to Hairless mating, Powderpuffs can result as well as Hairless pups. However from a Powderpuff to Powderpuff mating only Powderpuffs can result, as the long coat is a recessive gene. 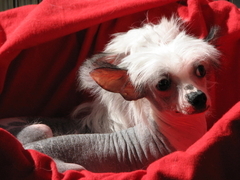 Crested are for the most part very sweet and love to cuddle and appear baby like. Like any other small animal they can be overwhelmed by crowds of strangers and can appear at less than their best. They need to be socialized when they're very young as they can tend to be a wary or skittish and can frighten easily in the presence of strangers. The head is slightly rounded and elongated skull presented in a graceful appearance with an alert expression dark eyes and tight thin lips. Cheeks cleanly chiseled, lean and flat, tapering into muzzle. Stop slightly pronounced but not extreme. Muzzle tapering slightly but never pointed. The nose is a prominent feature, narrow, favoring the muzzle. These beautiful creatures come in many colors. Two distinct types of this breed. Deer type, racy and fine boned, and Cobby type, heavier in body and bone.